vHe said: “I was probably a bit more nervous than usual because it was scaled down but at the end of the day, it wasn’t a competition – it was for fun. “If it went wrong, it went wrong, but I was being honoured so people were on my side. James was invited to New York after mum Sheila posted a video of him performing on the Autism Speaks charity’s Facebook page. Sheila said: “When he was on Britain’s Got Talent, some people said ‘did you have to mention he was autistic?’ but at the end of the day, it’s part of who he is. James now returns to The Hammond dance boarding school in Chester, where he’s doing well in his second year of a Learning and Skills Council-funded scholarship. He’s studying modern, tap and the discipline he’s increasingly veering towards, ballet. And he’s so settled at The Hammond, his academic work is also improving and he was recently removed from Special Educational Needs. His ultimate aim is to study ballet at sixth form and eventually join a company . Before then he’ll need his passport again as in May, he’ll dance at the World Autism Conference in San Sebastian, Spain, where he will perform on stage with the Basque Symphony Orchestra. :: For more about James, visit www.officialjameshobley.com. The world would be a very different place if it weren’t for autism. Even though the condition has only recently been recognized, there are many famous people throughout history who are thought to have been on the autistic spectrum. This is an article celebrating some of these people and the contributions they’ve made to our world. Mozart is recognized as one of the most gifted musicians and composers the world has ever seen. His talent was precocious and astonishing; by the age of 5 he was composing pieces and performing for Royalty. His work is regarded as some of the best classical music ever produced, and many pieces remain popular to this day. His influence on the development of western music is momentous. Considered one of the greatest artists ever to have lived, Michelangelo’s work is some of the most recognizable and well-known of all time. His genius was recognized during the course of his life and he was commissioned to paint the Sistine Chapel Ceiling by the Pope. The project took Michelangelo 4 years, and the result is one of the most acclaimed works of art on the planet. But his most famous piece is the statue of David, which is the epitome of Renaissance sculpture. Credited with the “discovery of gravity” and considered by many to be the most influential scientist who ever lived, Newton’s work on universal gravitation and the laws of motion dominated scientific thinking for the next 300 years. His other notable achievements include the invention of the reflecting telescope and his work on the visible spectrum of colours after observing the effect of a prism splitting beams of light into rainbows. But for the majority of people, Newton is most famous for having an apple fall on his head. Carroll is the acclaimed 20th Century writer behind Alice’s Adventures in Wonderland; one of the most enduringly popular pieces of literature ever produced. He was also a noted poet; his nonsense poem Jabberwocky is thought to be one of the greatest ever written. A 20th Century artist who’s credited with leading and inspiring the cubist movement of artists, Picasso was a remarkable man. He lived through two world wars but never fought, spending the second in Nazi occupied France where he continued to paint and sculpt throughout the conflict. Picasso is still revered as one of the most revolutionary and accomplished artists ever known. This article was written by James Armstrong on Behalf of Autism Care UK. A team led by MIT neuroscientists has developed a way to monitor how brain cells coordinate with each other to control specific behaviours, such as initiating movement or detecting an odour. The researchers’ new imaging technique, based on the detection of calcium ions in neurons, could help them map the brain circuits that perform such functions. It could also provide new insights into the origins of autism, obsessive-compulsive disorder and other psychiatric diseases, says Guoping Feng, senior author of a paper appearing in the journal Neuron. Please click on link to read further. Jussi Jaaskelainen welcomed a young group of visitors to the Boleyn Ground this week and ensured they had a great time visiting the home of West Ham United. The Hammers goalkeeper was on hand to welcome Anna Kennedy, who runs a national charity Anna Kennedy online dedicated to promoting the inclusion and equality of children and adults with autism and Asperger’s Syndrome. Anna and her fellow guests went pitchside and sat in the home dugout before being given a personal guided tour of the home dressing room by Jaaskelainen. There was also a chance to take a look in the away dressing room, the television media room where pre and post-match interviews are filmed and the tunnel area. 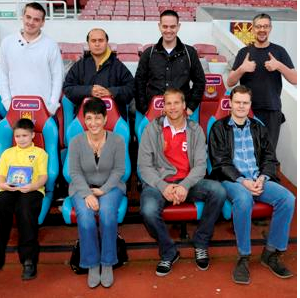 Ms Kennedy said of the visit: “Thank you to West Ham for a wonderful afternoon at the stadium. Our children and adults met with Jussi, who was a real gentleman and made the visit very special. We are looking forward to a continuing link with West Ham. The charity aims to give people with autism and Asperger’s Syndrome a better chance to live and build a structure for themselves, so they can look to lead independent lives. Ms Kennedy, who is the mother of two sons with autism, founded Hillingdon Manor School in west London, which is now a centre of excellence for children and young adults with autism. The school and the work of the charity have received national recognition and Ms Kennedy was made an OBE in the Queen’s Birthday Honours List earlier this year, together with being shortlisted for Tesco Mum of the Year award. Joint-Chairman David Sullivan donated a five-figure sum to the charity earlier this year – a pledge he made if Hammers won promotion. That money has helped the charity expand the work that it does. The home secretary, Theresa May, defied the American authorities on Tuesday by halting the extradition of British computer hacker Gary McKinnon, a decision criticised by the US state department but welcomed with delight by campaigners and politicians across parties in the UK. McKinnon’s mother, Janis Sharp, said May had been “incredibly brave” to “stand up” to the Americans. She said she was overwhelmed after the “emotional rollercoaster” the family had been through in the past 10 years. The US authorities have described McKinnon’s actions as the “biggest military computer hack of all time”. The Washington Post observed that the decision “could ignite tensions in an otherwise close transatlantic relationship”, while the former White House counsel Douglas McNabb said the US attorney’s office would be furious. The decision, which is the first time an extradition has been halted under the 2003 US-UK treaty, prompted immediate delight from those who campaigned to prevent McKinnon’s removal and politicians from all parties. Nick Clegg said he wanted to pay tribute to Sharp’s determination to speak up for her son over 10 years. “I’ve long argued that I think it would have been wrong to send someone as vulnerable as Gary McKinnon to the United States and also I’m delighted that the home secretary has set out some plans about how we rebalance the extradition arrangements between the UK and the USA,” the Liberal Democrat leader said. The only discordant note came from the former Labour home secretary Alan Johnson, who said the hacker’s human rights case had been rejected by judges in 2009 and claimed May had made the decision “in her party’s best interest; it is not in the best interests of the country”. He disclosed that the US authorities had been prepared to allow McKinnon to serve his sentence in a British prison when Johnson rejected McKinnon’s earlier appeals. The home secretary told MPs that the treaty, which has been criticised as “lop-sided”, was “broadly sound”. But she made an important concession to critics, announcing that a “forum bar” would be introduced. This will give a British court the power to bar prosecution overseas if it believes it will be fairer for the accused to face a British trial. This change may, however, take some time to come into effect as, rather than implementing an existing clause in the 2003 Extradition Act, May will introduce fresh legislation to overcome problems of delay and possible “satellite litigation”. She confirmed to MPs her intention to scrap the home secretary’s discretion under the Human Rights Act that enabled her to prevent McKinnon’s extradition. “Matters such as representations on human rights grounds should, in future, be considered by the high court rather than the home secretary. She opened the door for more wide-ranging reform of the extradition process to reduce delays of up to 14 years by looking again at the provision of legal aid for terror suspects in national security cases and introducing a permission stage for appeals to UK courts. The former Lib Dem leader Sir Menzies Campbell told May the treaty still needed reform, in particular the standard of proof required. He hoped that no British citizen would be sent to the US unless there was “probable cause”. But the family of Babar Ahmad, who along with Talha Ahsan was deported two weeks ago to the US on terrorism charges, accused the legal system of double standards. 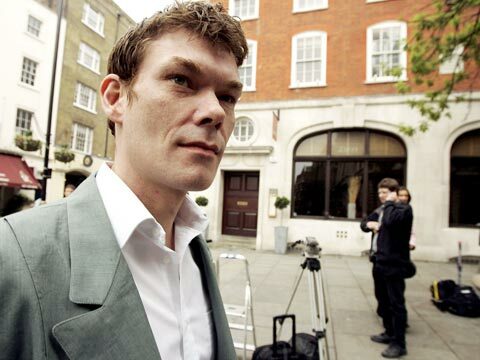 “We strongly welcome the decision not to extradite Gary McKinnon. We would not want his family to experience the pain and suffering we have all been enduring since Babar was extradited,” they said.